Drake says: "Amsterdam's numerous canals make it the Venice of the North, but all of Nederland is filled with waterways. A rail journey in this low-lying country – where 20% of the land is below sea level – crosses countless bridges." 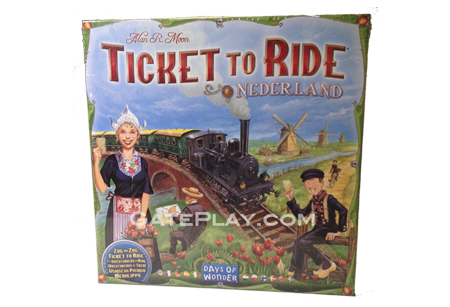 Ticket to Ride Map Collection: Volume 4 - Nederland contains a new game board with new rules for use with Ticket to Ride or Ticket to Ride: Europe with player now creating train lines in the Netherlands. 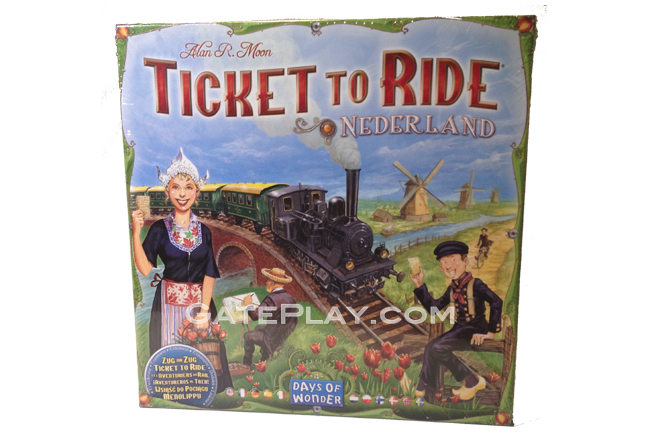 The basics of TtR gameplay remain the same as always — players collect train cards in order to claim routes between pairs of cities with the overall goal of completing tickets they hold in hand — but Ticket to Ride: Nederland twists this gameplay in two ways. 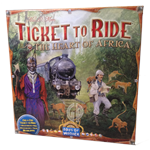 First, nearly every route on the game board is a double-route, with two tracks connecting cities. Both of these routes are in play no matter how many players are in the game. Second, every route — whether double or single — has a bridge toll that a player must pay when building on that route. On a single route or the first track of a double route, the player pays this toll — which costs 1-4 coins — to the bank; on the second track of a double route, the player pays this toll to the player who built the first track. 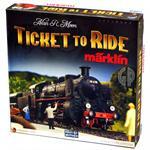 Players start the game with 30 coins, and if you can't pay a toll, you must take a loan card to cover the fare, with each loan costing you 5 points at the end of the game. In addition to helping you avoid loans, coins matter because at game's end, players receive a bonus based on how many coins they hold relative to everyone else. In a five-player game, for example, the player with the most coins scores a 55 point bonus; the 2nd place player scores 35 points, and the other players 20, 10 and 0 points. If you've taken a loan, however, you're ineligible for this bonus scoring, so players have an incentive to build early and often. These coin bonuses are balanced by the multitude of destination tickets with large point values: six of them are worth 29+ points while another seventeen are worth 17-26 points. 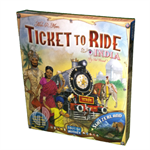 Check out "Ticket to Ride Map Collection: Volume 4 Nederland" on BoardGameGeek.com!